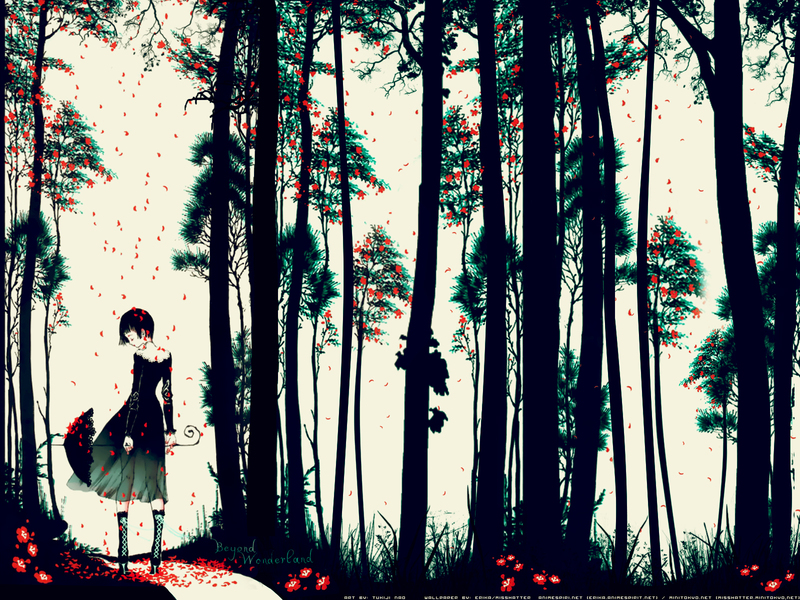 I think this work deserves to be elited because the composition and attention to the tree detailing is quite lovely. You've managed to generate quite a lovely variation of trees and successfully created some depth and space in this wall. The colour scheme is also quite lovely and you've matched the background to the scan well. Things I think I want you to pay attention to - the flowers at the bottom on the right of the wall should be darker in colour and fade into the background, so the brightest red is near her feet - that's the main focus of the wallpaper. Actually, I think the flowers are out of place - if you compare the size of the flowers with petals and her hand, they're actually a bit too big. However, overlooking that I think this is quite nicely executed. I can feel the peaceful scenery you've created. Thumbs up for you! wow, the colors are simply beautiful. Really good work! and thanks for sharing for us! super lovely!<3 great job on everything! Esta es como una bellisima metafora de una chica buscandose a si misma en medio de mil sensaciones. thanks for the scan! the artist is Nao isn't it? I love his illustrations!